Time of Origin: Gallifrey, far future, but a bit earlier then The Doctor. 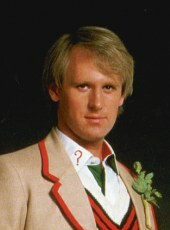 Appearances: "The Brain of Morbius","Warmonger", "Sisters of the Flame" and "The Vengeance of Morbius"
Doctors: Fourth Doctor, Fifth Doctor and Eighth Doctor. History: Originally, Morbius was the President of the High Council of the Time Lords, one of the most distinguished of them all. However, that all changed when he developed an obsession with leading the Time Lords on a path of conquest and glory of the whole universe. He was deposed as President and would have been executed, but because of his past services, the sentence was restricted to exile from Gallifrey, never to return. However, he was bitter about the sentence, vowing that he would return and claim his title as ruler of the universe. Forced to start again from scratch with his army, Morbius gathered together an army of Gazteks, basically little more then thugs, and arranged for a peace conference on the Hospice of the planet Karn, claiming that his intentions were to band the outer planets together to protect themselves from the powerful empires in the sector, although he was really more interested in starting a military campaign, using the conference as cover to start his plans. Also, he had another, far deadlier reason than that; Karn was also the location of the Sisterhood of the Flame, a group that held the secret of the Elixier of Life, a drink that could extend life indefinitely, and Morbius wanted it for himself. However, he bit off more then he could chew when he selected the Hospice, as it had two very particular patients in it at the time; the Fifth Doctor and Peri, The Doctor having gone there when Peri was nearly fatally wounded in one arm by a pterodactyl-like creature on a planet they'd visited. Morbius made arrangements for a dinner date with Peri, but when his attempts to destroy the Sisterhood and steal the Elixier were thwarted, he decided to abduct her instead and fled the city, only pausing long enough to send The Doctor a telepathic message that revealed his true name to the other Time Lord. Fortunately, Peri managed to escape Morbius by playing on his vanity and claiming that she had contracted a fatal skin disease, causing Morbius to eject her into space, where she drifted aimlessly until she crash-landed on the planet Sylvana, and eventually began to lead a small rebellion against Morbius. 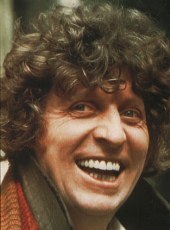 The Doctor, meanwhile, made contact with the Time Lords of this era, and eventually decided that there was only one way to stop Morbius; to stop him becoming a martyr, he must be defeated in a military campaign; thus, the great empires of the galaxy would have to unite in one alliance to take him down. Convincing them to work together would require an ambassador with great imagination and experience of alien cultures, who is unafraid to take risks... and only The Doctor was qualified. Despite his natural reluctance, he eventually took the job up, gathering together an army of humans, Draconians, Sontarans, Ice Warriors, and even Cybermen. He also had thirty Orgons to serve as his personal bodyguard, and it was from them that this new version of The Doctor gained his name; being unable to pronounce his full title of 'Supreme Coordinator', they took to calling him 'Supremo', and the name stuck. The Doctor was also responsible for creating their strategy to stop Morbius single-handedly, earning the respect of both the experienced Sontaran and Draconian commanders at once. Since they lacked the forces at the time to attack Morbius directly, or stage a series of divirsionary attacks to divide his resources, The Doctor decided to follow in Morbius’ footsteps, liberating the planets he'd conquered one by one. Every time Morbius conquered another world he had to leave troops behind to occupy and subdue it; thus, every victory weakened him, while every time The Doctor's forces liberated a planet they would become stronger and thus be well-practiced when the time came for the final battle. Eventually, The Doctor reached Sylvana, where he was finally reunited with Peri, and then tracked Morbius back to Karn for the final battle, where Morbius was going to make another attempt to claim the Elixier for himself. After The Doctor and Peri departed, the separate members of the Alliance returned to their empires, and the Hospice was abandoned, as nobody had the heart to rebuild it after the battle. Karn itself was abandoned, apart from the Sisterhood, who sheltered in their Temple, growing ever more fearful as their sacred Flame began to die and their stocks of Elixir dwindled. Solon hid in the ruins of the Hospice, continuing his work, vowing to restore Morbius to life. And then, one dark and stormy night, a curly-haired stranger and his young friend arrived on Karn... The Fourth Doctor and Sarah Jane Smith. When he met The Doctor and Sarah (Not recognising The Doctor, obviously), Solon decided that The Doctor's head was just what he needed to finish off Morbius's new body; he'd already created a body from victims of various assorted crashes on the planet, but lacked a head of the right size for Morbius's brain. He contemplated using The Doctor's head, but eventually decided to use The Doctor to acquire a sample of the elixier by convincing him that Sarah had been permanently blinded and the elixier would be needed to cure her, while he placed Morbius's brain in an artificial 'tank' he'd developed in cases he'd been unable to get an alternative. However, this gave The Doctor the chance he needed to stop Morbius. Taking Solon out by adding cyanide gas to the air vents, The Doctor then challenged Morbius to a mind-bending contest, where two Time Lords faced each other in mental combat. The Doctor was knocked out by the mental strain required, but he managed to overheat Morbius's brain enough to let the Sisterhood throw him off a cliff. The Doctor was badly injured by the contest, but the Sisterhood sacrificed the last current sample of their elixier to heal him. The Doctor departed, leaving the Sisterhood with a box of matches to restart the Flame if the need arose. 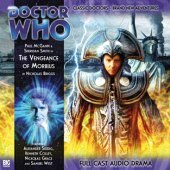 Some time after this, the spirit of Morbius returned to plague The Doctor again in his eighth incarnation, beginning with the TARDIS being drawn to Karn ("Sisters of the Flame" and "The Vengeance of Morbius"), now owned by the wealthy Mr Zarodnix, a man so wealthy he regularly bought and sold planets. Although Zarodnix attempted to capture The Doctor, The Doctor and current companion Lucie Miller were recovered by the Sisterhood, who revealed that Zarodnix was the leader of the Cult of Morbius, a group dedicated to recovering everything related to Morbius… and was now seeking a Time Lord as part of a plan to revive Morbius. Although the Sisterhood attempted to execute The Doctor and Lucie in a matter dispersal chamber to prevent Zarodnix using them in his plan, Zarodnix instead captured Straxus - the Time Lord sent to find out what happened to The Doctor - subsequently using him to restore Morbius by fusing a piece of Morbius’s brain to Straxus’s DNA using genetic fusion, creating a new body for Morbius. As Morbius launched an attack on Gallifrey using the salvaged Stellar Manipulator ("Remembrance of the Daleks") to take control of the Eye of Harmony, The Doctor was forced to flee Gallifrey in the TARDIS with the last of its power, unintentionally travelling a decade forward in time to a universe where Morbius had resumed his campaign of conquest (Although his unstable genetic structure meant that he was still dependent on ‘donations’ from Straxus to stay alive). With only one chance left to stop Morbius, The Doctor used the last of the TARDIS’s power to send a message to the remnants of the Sisterhood, subsequently confronting Morbius and taking the Stellar Manipulator control from him. With power restored to Gallifrey, the Time Lords were able to roll back time and undo Morbius’s new empire, Morbius once again falling into the canyon where he had died before (Although The Doctor was believed to have perished with Morbius, it was later revealed that he had been teleported away by the Sisterhood to the distant planet Orbis, Lucie later recovering The Doctor with the ‘aid’ of their old foe the Headhunter).